We rely on sponsorship to operate. Being competitive in motorsports typically requires a significant financial investment, much of which is usually obtained through various forms of sponsorship. All forms of sponsoship are welcomed and we graciously thank and appreciate all of our sponsors to date. Sponsorsships of all kinds are welcomed, whether they are product, financial, service oriented or whether they aid the team itself through volunteers or with marketing and administration. With Christiansen Racing, we accomplish everything cost-effectively and efficiently ensuring maximum value from our sponsor's contributions. 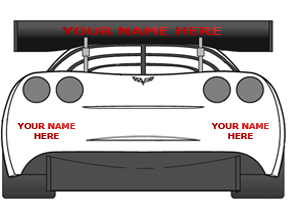 Depending on the type and value of contributions, we will advertise sponsors on the car hauler, truck, suits, helmets and, of course, on the race car. If you are interested in learning more about how sponsorship works or contributing to the teams in any way, please Contact Us. Get real time track side updates of practices, testing and racing. We'll be tweeting race qualifying results as well as real time racing updates from the pits and from the stands! For fans and anyone with a scanner, you can tune into the Christiansen Racing Team at events and listen to the pit crew and driver communication.